No midweek adventures this past week, but the weekend’s adventures took me to Albuquerque, Santa Fe, and several stops in between. Friday night started off the adventures with seeing some improv in Albuquerque. I saw “The Show” at The Box Theater, and it was a wonderful short form show with a lot packed in to it. The cast was great, and the show moved very quickly and stayed funny throughout. I didn’t snap any pictures at the show, but Albuquerque did have some cool buildings that I took some pictures of. Saturday morning, I went to the Petroglyph National Monument. I only had about 2 hours at the park in order to make it to my next stop, so I did the Boca Negra area trail. The 3 trails in the Boca Negra area took about an hour and a half total to complete, and I saw a few hundred petroglyphs in that time. Unlike other places where I had seen petroglyphs before, these petroglyphs were pretty concentrated and were very close to the trails. The trail was described as mostly paved, but it really seemed like they just added a little bit of paving between the rocks going up the hill and was still very rough. I was a little surprised as well by the lack of surveillance or security in the area. Unlike El Morro where the inscriptions were all under surveillance to try to prevent vandalism, most of the petroglyph area appeared unwatched. There were definitely some areas where people had carved things on the rocks much more recently, and there were even signs about how those carvings were not really removable, but the actual enforcement seemed to be much more on the honor system. Parking at the Boca Negra area is $1 everyday but Saturday, and $2 on Saturday, or included in the National Parks pass. It was definitely neat to get to see so many petroglyphs close up, and the informational markers along the trail definitely helped make sure you were looking in the right places. My second stop on Saturday was Pecos National Historical Park. I signed up to go on a Civil War sites van tour with a ranger at 1:30, and I was told when I signed up to be at the visitor’s center around 1 to check in. I arrived at the park around 12:30 because I didn’t want to be late. Because I was so early, I got to check out some other areas of the park before the tour. The Pecos area is right in the middle of the Glorieta Pass which made it a geographically important area for several different groups. There is a walking trail behind the visitor’s center that is about 1.5 miles long, and has an option to make it shorter half way through. The trail goes through Pueblo ruins, and an old Spanish church. The Pecos ruins were interesting and unique from other Pueblo ruins I have been to because you can see where the town physically divided in response to the Spanish arrival and the spread of the church. There was space between the ruins in the South and the North, and it is thought that those who lived in the North maintained their traditional beliefs, while those that lived in the South were sympathetic to the Spanish and were converting to Christianity. The Santa Fe trail also passed right by the same area, but the ruins hadn’t been discovered yet at the time the Santa Fe trail passed through. It was really interesting to think about that people from several different time periods had passed through the same area, but they had no idea of the people or cities that were there before them. The civil war van tour was very neat. I ended up being the only one who had signed up to go, so it was just me and the park ranger on the tour. I didn’t take hardly any pictures along the tour, but I definitely learned a lot. The tour went over some important sites for the Battle of Glorieta Pass, which pretty much was the Civil War in the West. The first stop on the tour was the Forked Lightning Ranch. This was the Union hospital after the battle, and was right across the road from the area where the Union soldiers had camped before the battle. The ranch was later owned by Tex Austin, and then by Greer Garson. After the ranch house, we drove to where the battle had actually taken place. The battle area is full of trees now, but it was still pretty easy to tell where soldiers would have been and why different approaches were taken. The Union thought they had the path blocked from the Confederates advancing, but the Confederates actually ended up on the North side of the battlefield past the Union troops. The Union ended up winning the battle thanks to help from a Native American. The Confederate hospital after the battle was Pigeon’s Ranch that seemed to be situated in the middle of the battlefield. The last stop of the tour was the monuments to the fallen soldiers. It was definitely interesting to see the difference in language on the 2 monuments and the different way that the different sides described the battle. It was a really neat experience getting to go on a 1 on 1 tour with a park ranger, and I definitely feel like I learned a lot more than I ever could have on my own. The park entry fee at Pecos was currently being waived, so it was free to enter. The van tour was also free to go on, but there is a max of 5 people per van tour, so it is advised to call ahead to make sure you get a spot. The park does offer 2 different van tours depending on which day you go. The other van tour is of the Forked Lightning Ranch property (the civil war tour stops just at the entrance to the ranch and doesn’t explore back on the ranch). I ended Saturday evening going to MeowWolf. MeowWolf is like one part children’s museum, one part art museum, one part haunted house/ mystery game. It was definitely a cool experience. The space is put together and maintained by an art collective, and it is described as an immersive experience in non-linear story telling. There were lots of areas to explore, and every section seemed new and different. Not only was there stuff to look at, but there were audio and lighting elements used throughout as well. They encouraged interacting and picking up or touching pretty much anything in the space which was really cool. I mostly just explored and tried to take everything in. There is a mystery to solve that seemed like it would have been cool to try if I visited again. The clues were a little hard to follow if you hadn’t explored at least a little bit first, and there was only one copy of the clue at each spot, so you have to wait a little while to even read some of the beginning clues let alone start figuring out what they meant. I gave up pretty quickly because I wanted to spend more time exploring and seeing the space than reading through all of the clues and papers. The cost for entry is $20, and I wish I would have had more time to spend to try and figure out the mystery or explore some more. The space is definitely a sensory overload, and it probably would have been hard to spend a whole lot longer in it without taking a break. Sunday morning, I went to the Valles Caldera National Preserve. Getting there was an adventure of its own. The quickest way to the preserve from Santa Fe is through Los Alamos. Since there is the National Laboratory in Los Alamos, the road through Los Alamos is blocked with booths that look like toll booths all the way across. When I got there, only 1 booth was open, and I almost missed seeing it. The booths are not toll booths, they are stops for ID checks since the road is so close to the labs. It was pretty cool getting to drive by the labs and all of the different testing areas. After getting through Los Alamos, the road climbs along the side of the mountains, which I was not a huge fan of. The turnoff in to the park turns to a mixed dirt and gravel road, and it leads to what looks like it is a small house, but is actually the visitor’s center for the preserve. When I got to the visitor’s center I asked what the best things to see or do at the preserve were, and I was told elk viewing at sunrise or sunset were their popular activities. This was a little strange since the park is only open from 8-6, so the park is not actually open for sunrise or sunset. There are several overlooks of the park that are not actually within the park that I guess would be where to view the elk from. Since I didn’t know about the elk viewing until after the time had passed, I did not get to see any of the elk. There aren’t really any trails or things to do near the visitor’s center, and so I decided I would go ahead and get a backcountry vehicle permit and do some exploring in the park. The road through the backcountry is all dirt and gravel, and there were some spots that were a bit muddy from the rain. The road was definitely a little rough in parts, but the park itself was beautiful. It is such a large area that it was really easy to get lost in the natural beauty and not see another person in any direction. I did occasionally pass other visitors who were fishing or biking in the park, but most of the time in the park was pretty solitary. The scenery and landscape throughout the park was just stunning, and it was really neat to be so aware of how big and vast natural beauty can be. There was definitely far less to do for human visitors to the preserve than many of the other parks I have been to, but it was also really neat to see how much more of what the preserve is doing is about the animals and plants that call it home and not about the people who come to visit. The entry fee at Valles Caldera is currently waived, and the backcountry permit was also free. Backcountry permits are said to be limited to 35 a day, so it is advised to get there early. It looked like there were also several guided tour options that probably would have been neat, but I didn’t see the sign for them until after I was leaving. 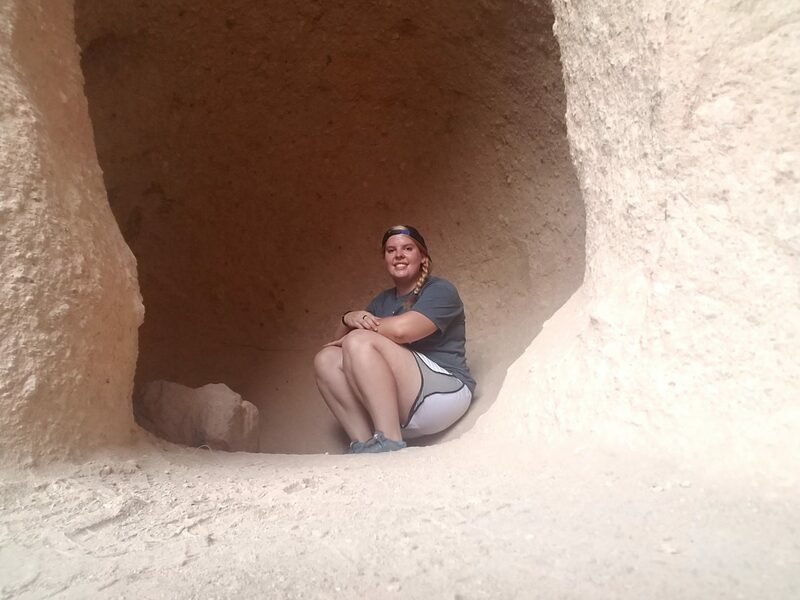 My last stop of the weekend was at Bandelier National Monument. The monument is another set of Pueblo ruins, but there are also some cliff dwellings at the site. The rock faces on the edge of the canyon were much softer and full of holes than many other places, and this made it easy to create cliff dwellings. There is a large section of ruins that looks like many of the other ruins I have seen and is not attached to the cliffs, but then there are several other structures and dwelling along the cliffs as well. Some of these were just holes for posts as they built the structures out from the walls, and some were actual rooms in the walls. There were even some ceremonial chambers in the walls as well. There is a large dwelling that is near the top of the cliff that took 4 ladders to get to. it was pretty neat getting to climb up and see not only where people had lived, but also get to look out over the valley. The valley had a small stream that runs through it that normally stays pretty small, but flooded pretty badly several years ago. It was really neat to get to see the evidence of the old flood and the huge trees that had been carried down to the valley by the waters. It was really neat to get to see the great effort and triumph of the city created by the Pueblos and the evidence of the destructive powers of nature next to each other. The entry fee for Bandelier is $20 for a vehicle. The road to the visitor’s center is also only accessible by shuttle bus from 9-3. Parking was not difficult and was very close to the shuttle bus stop. The shuttles arrived quickly, and they continue to take visitors returning to their cars until 5, so you don’t have to rush to finish by 3 if you arrive after lunch. I loved getting to see and do so many things this past weekend. The variety of cultural, historical, natural, and beautiful things I got to see was really neat. Every place still has something new and exciting to learn. Even places that are all ruins from the same people groups are all so unique and different from each other that it is absolutely amazing to get to learn so many new things from each one of them. Gallup also gave be an awesome sunset on the way back .